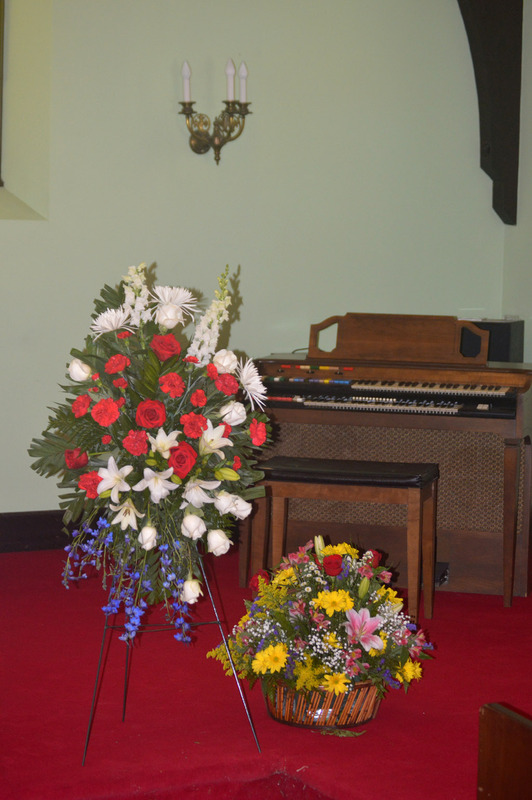 The Bradley Memorial Chapel was built by a generous gift from Jane Loomis Bradley in memory of her husband Silas L Bradley. The chapel, of Gothic architecture, was completed in 1893. 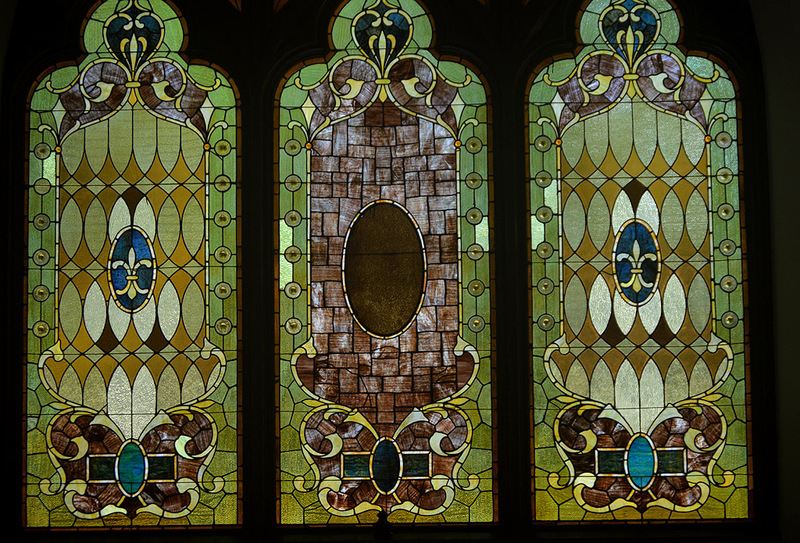 When the chapel was almost 100 years old, time and nature had severely weathered the building. 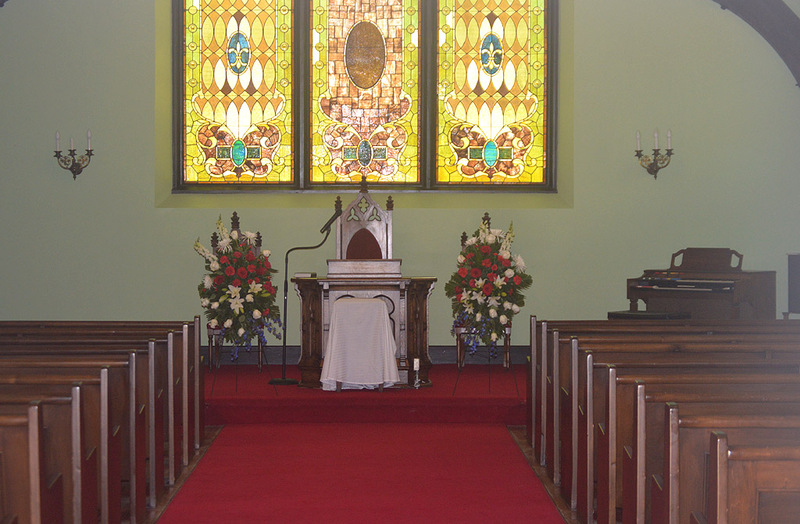 The Cemetery campaigned to save the chapel and through the generous donations of many people, necessary repairs were made. The speech that follows is from the ceremony where the chapel was reopened. When I was asked by Marie Infanger, Chairman of the Rededication Program Committee, to give a short talk on the history of Fort Hill cemetery, I realized that his covers a great number of years and there is a vast amount of information available. I have selected a few topics I hope you will find interesting. Hall's History of Auburn, printed in 1860, describes Fort Hill as "a bold eminence located in the western part of Auburn, which, by the beauty of its groves and its prominence as a point of observation, should, in the opinion of many citizens, be converted into a park". The idea of making Fort Hill into a park was not a new one. In 1836 the village trustees published a map on which Fort Hill is designated "Eagle Park". Fort Hill is truly a fortified hill. It is the best preserved of the many fortified villages of the ancient Cayuga Indians. The Cayugas lived in this area for over four hundred years after defeating the Alleghan Indians around the middle of the 16th century. Historians disagree which Indian tribe built the Fort. The consensus of opinion is that it was built by the Cayugas for defense during the many wars that raged between the Indian tribes before the founding of the Iroquois Confederacy. After the Iroquois Confederacy was formed, the wars ceased, and the Cayugas left the Fort to seek new homes. The Fort soon fell into decay. There is little left today to indicate the outline of the Fort, which was quite visible in 1860. The enclosure measured 416 feet east to west and 310 feet north to south. The first cemetery in the settlement was located at Washington and Genesee Street. This was declared unsuitable and the present cemetery on North Street opened prior to 1800. By 1845 the North Street Cemetery had become crowded and more room was needed. On May 15, 1851, the Fort Hill Cemetery Association was formed under the recently enacted state law of April 27, 1847, providing for the incorporation of Cemetery Associations. The land was conveyed to the Association by Mr. Thomas How of Auburn and Mr. George Hatch of New York for the nominal sum of $1.00, plus other considerations. Fort Hill Cemetery was formally consecrated on July 7, 1852. The Logan monument was erected this same summer. It is 56 feet high and built of native limestone. The mound on which it stands was part of the original fort. When Fort Hill Cemetery was opened it was approximately 20 acres. Today it is almost 90 acres. 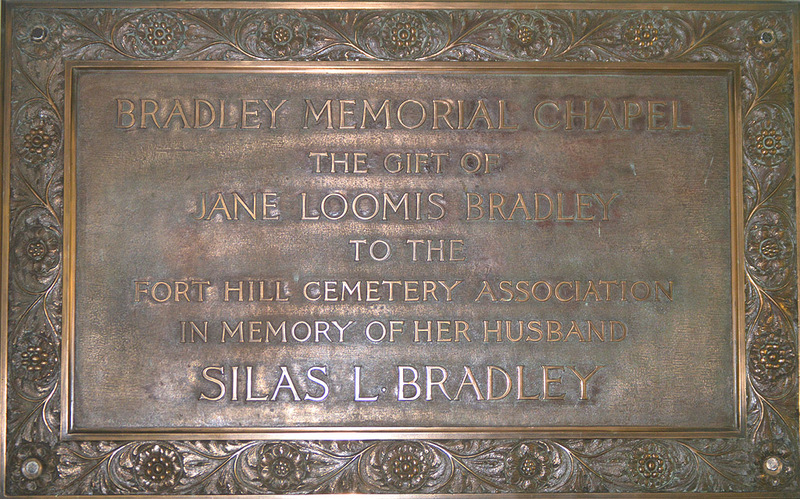 The Bradley Chapel, which we are here to rededicate today, was given to the Fort Hill Cemetery Association by Jane Loomis Bradley in loving memory of her husband, Silas L. Bradley. Silas Bradley was born in North Haven, CT, in 1817. At the age of 20, he came to Auburn and established himself as a merchant. He married Jane Loomis of Auburn in 1841. The Bradleys had two children, a son, Henry, born in 1848, and a daughter, Clara born in 1854. Both children predeceased their father. Silas Bradley was best known as President of the National Bank of Auburn, a position he held from 1877 until his death in 1883. He was a successful businessman and was active in civic affairs. He was a City Alderman in 1852. At the time of his death he was a Trustee of the Auburn Savings Bank, the Orphan Asylum, and the Auburn Water Works. Mr. Bradley was a member of the Second Presbyterian Church. He was ordained an Elder in 1854. The family home was at 200 Genesee Street, the present location of Pettigrass Funeral Home. After Mr. Bradley's death, Mrs. Bradley continued to live at 200 Genesee Street until her death in 1890. In 1889 Mrs. Bradley commissioned Julius A. Schweinfurth, architect, to design a Memorial Chapel and Gate Lodge as a memorial to her husband. Julius A. Schweinfurth was born in Auburn on September 20, 1858. He was educated in the Auburn public schools. In 1879 he went to Boston where he was employed as a draughtsman by Peabody and Stearns, Architects. He had just been married when he was offered the Bradley Chapel commission. Schweinfurth chose the style of a small English Country Church in Cornwall, (St Buryan church), as a model for the project. The original design was in the form of an "L". The tower and chapel are very similar to what Schweinfurth proposed. The Gate Lodge was never built. It was designed to have two floors. The main floor containing a parlor, sitting room and kitchen. The upstairs was a large room accessible by two staircases. Mrs. Bradley died before construction began. In her will she left the sum of $25,000 to build the memorial and to establish a permanent maintenance fund. The Executors of her estate and the Trustees of Fort Hill has equal voice in the final plans. The Memorial Chapel and Tower were completed in 1893. For many years the office of the Fort Hill Cemetery Association was located in the William H. Seward Bank on Genesee Street. The present office was the gift of Mrs. Eliza Wright Osborne. Completed in 1928, it has been a valuable asset to the Cemetery and has been in continuous use. For the past several years, the Bradley Chapel had been the topic of lengthy discussion at every Trustees meeting. The building required constant maintenance and the lack of adequate funds made it necessary to do only the most needed repairs. The deteriorating conditions of the building was made evident in the summer of 1983 when a neighbor reported that there were several large stones ready to fall from the top of the north wall of the office. The cost of repairing this wall was over $10,000.00 as the wall had to be removed stone by stone and then relayed. The Trustees were at the point where a decision had to be made on the future of the Chapel, the Tower, and the Office. We did not have the money to repair the entire building. A proposal was made to get bids to tear down the Chapel and the Tower. As winter was approaching this proposal was set aside to be reviewed in the Spring of 1984. Fortunately one of our benefactors heard of this proposal and asked if it would not be possible to renovate the buildings if funds were made available. This gave a little hope to the Board as to the possibility of securing funds from foundations and concerned citizens to renovate the existing buildings. Architect John Critchley was contacted and requested to make an inspection to determine if the buildings were structurally sound and to advise if renovation were possible. His report of August 3, 1984 was very encouraging. He advised that the buildings were in sound condition and worth saving. Through the generosity of several foundations and individuals a substantial portion of the money needed for renovation was raised. The Board voted to accept a challenge grant and proceed with the work. Mr. Critchley was hired in January 1985 to prepare specifications for the work and to obtain bids. Bids were opened May 3, 1985, and the Sabotka Co. Inc. of Auburn was awarded the general contract. Work was started promptly and the bulk of the renovation was completed by November. On behalf of the Board of Trustees, it is my pleasure to thank everyone who helped us meet the challenge grant and made it possible to save these beautiful buildings. 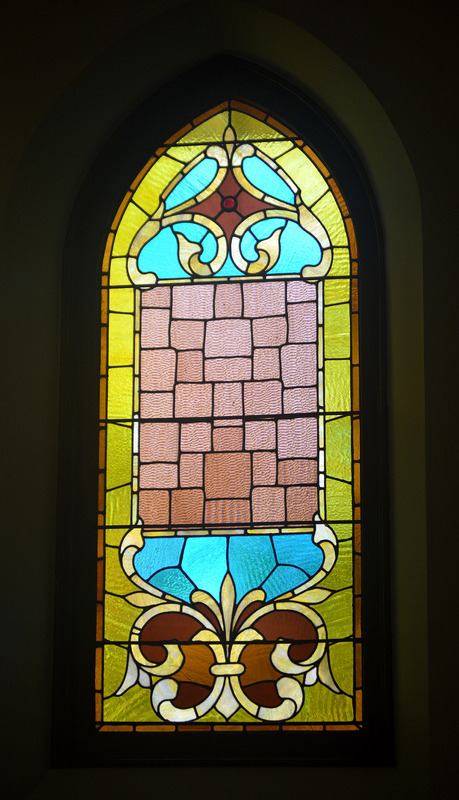 It is our hope and desire that the Bradley Chapel be used by the community for many programs of a religious nature. 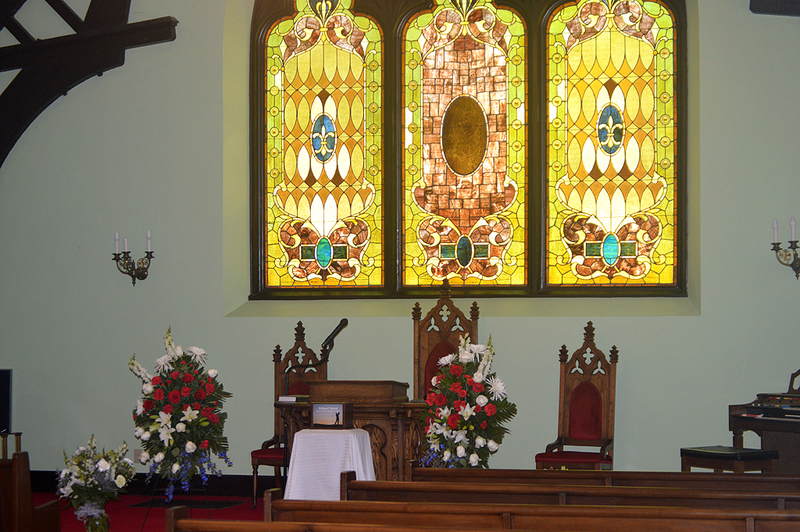 This Chapel is an ideal place for Interdenominational Meetings, Weddings, Concerts, as well as for Funeral and Memorial services.